Naptown natives, Brian Kelly and Joe Schnieders met in high school, but it wasn’t till 2011 at Schnieders’ annual croquet party that the two officially decided to start a vintage sports t-shirt company. “Everyone loves t-shirts. Everyone will always wear t-shirts. It’s one of those products that anyone can buy and relate to. It appeases all.” Kelly explained. They agreed on the name Hayes and Taylor, which was the name of Kelly’s former blog. Kelly took on the day to day operations of the business along with contributing most of the company’s designs while Schnieders oversees the company’s live events and newly opened retail store. With both Kelly and Schnieders working full time at Salesforce, they partnered with local printing company TheBrickShirtHouse to help keep up with printing demands. Between on-line orders, live events and wholesale purchases Hayes and Taylor has sold an estimated 11,000 items. The t-shirts are soft, durable and fit well making them popular perfect to showcase Hoosier Pride. Two of the most popular vintage t-shirts include the witty Deer Creek tee that pays tribute to always name-changing amphitheater in Noblesville and the classic Market Square Arena tee, which was the home of the Pacers between 1974-1999 and the location of the final live Elvis concert. “We wanted something fun and local that’s more than just slapping logos on shirts,” Kelly said. The company also specializes in vintage collegiate apparel, including designs of Indiana University, Butler University and Ball State University etc. Hayes and Taylor also offers hoodies, beer glasses and koozies. 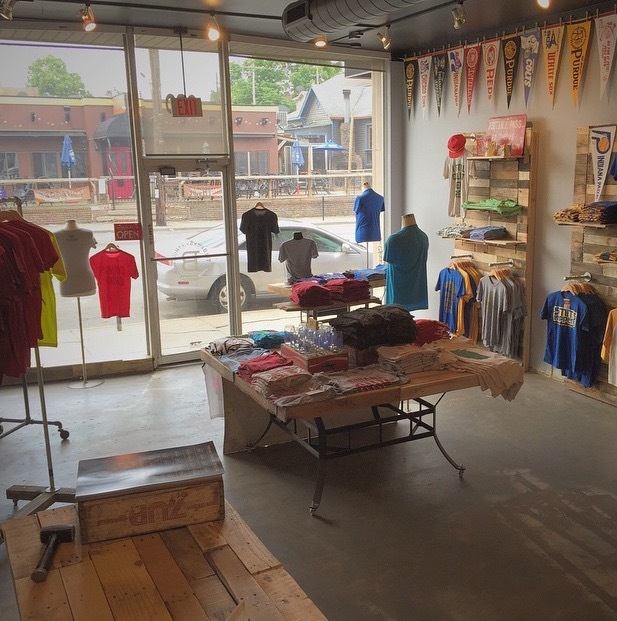 Hayes and Taylor just recently opened up their very first retail shop on Broadripple Ave. The space pays homage to Indiana’s rich sports history fused with a strong sense of collegiate spirit. Hayes and Taylor also shares the space with TheBrickShirtHouse printing company. An official grand opening is planned for later this summer.